I’m sure you’ll be hearing a lot about the $900 billion deficit in President Obama’s 2013 budget proposal (a political document as much as an economic one), but keep in mind that the path to balanced budgets is going to be hard, hard, hard. And it’s going to require a much deeper understanding of the actual spending on the part of the American public. As I suggest in the title to this post, spending on Social Security, Medicare, Medicaid, and national defense totals $2.985 trillion in the proposed budget. 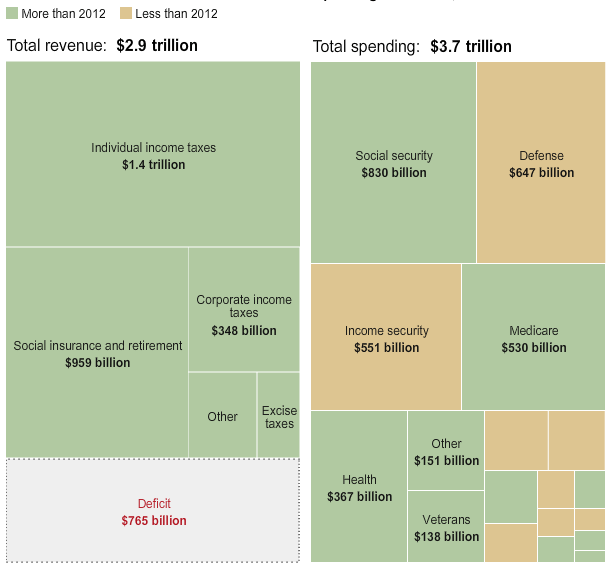 Total revenues from taxes and a small number of other sources (like duties) are $2.902 trillion. If we’re serious about cutting federal spending, then we’re going to be making large cuts to very popular programs, including those that support older Americans. Or we’re going to have to pair program cuts with increased tax revenue. Or just increase revenues to ensure that older Americans continue to get their current level of benefits. 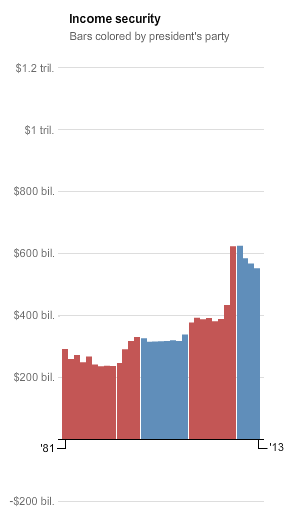 Please note that in the Washington Post graphic, all the historical data has been adjusted to 2012 dollars, but also keep in mind that the population has increased considerably — and the number of older Americans who qualify for Social Security and Medicare has increased dramatically. Income security spending (food stamps, federal unemployment benefits, etc.) exploded in the final year of the Bush presidency, but is now declining. If the economy improves more quickly this level could fall further. The good news is that we can solve these longterm problems. The bad news is that some political leaders continue to perpetrate the fiction that it can be done easily and without either large tax increases or sizable cuts to popular programs.